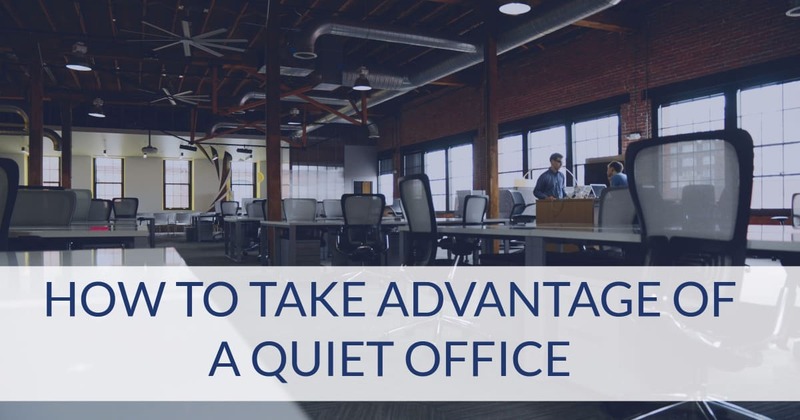 2017 Update: We still stand by this advice on how to take advantage of a quiet office during holidays, but you may also want to check out all of our posts on holiday business etiquette. It’s coming: the dead period around the holidays when many of your coworkers are out on vacation, projects are done or winding down, and no one wants to start anything major before the end of the year. In late December, a quiet office can feel like a ghost town to people who are still there — but you can take advantage of it in many useful ways. What do you do when the office is quiet around the holidays and you’re still at work? Clean and organize your office. Dust your shelves and file cabinets, see what random things have fallen behind your desk over the past several months, clean your keyboard by shaking out the crumbs or using a can of compressed air, wipe your monitor screen, use disinfectant wipes on your phone and desk, etc. Take some time to sort through old papers and recycle what you don’t need. (For office-cleaning tips, check out seeJanework’s detailed list.) Also, browse through your company’s office supply catalog: Is there anything that would help you organize better and cut down on clutter? And have you left anything in the office fridge for too long? Ditch it. Catch up on your work-related reading — or writing. Go through relevant print/email newsletters, minutes from any meetings you couldn’t attend, useful articles in industry publications, etc. 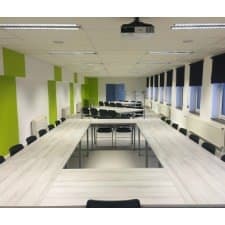 Has HR or Accounting sent out any new policies or procedures recently? Take some time now to look them over — not exactly thrilling reading, but a smart thing to do. Consider writing something yourself, as well — perhaps a newsletter article for a professional organization you’ve joined. 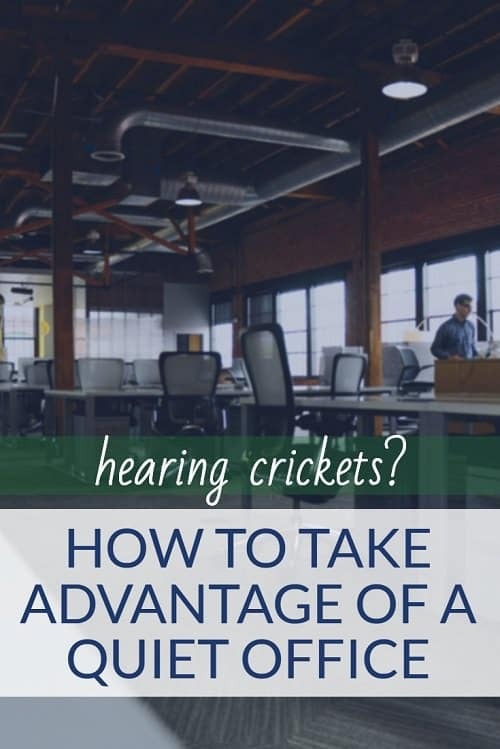 Use the quiet office environment to concentrate while you’re writing. Get a jump on your networking for next year. Think about which contacts you’d like to meet with — have breakfast, coffee, lunch, etc. — and get in touch with them to set something up. Are there any professional organizations you’re interested in joining? Take advantage of a quiet office by doing some research, and put a meeting in your calendar. Plan a vacation. If you simply don’t have enough work to do and have done some of the above already, daydream about and plan your next trip: Price flights, look at hotel websites, check out Yelp for restaurants where you’re going, and so on. See our posts about vacation packages for busy women and taking vacation time. Need destination ideas? Check out “50 Best Places to Travel in 2017” from Travel + Leisure. How do you take advantage of a quiet office during the holidays? If the workload itself doesn’t lessen much for you, do you find it hard to motivate yourself when you think of your absent coworkers who are at home sleeping in and binge-watching Netflix? Does it make YOU want to have your own Netflix time at your desk? well these all sound very productive. What I actually do — chat with other coworkers in the same boat, go out for coffees and long lunches and errands, go home early, etc. December and January are actually my busiest periods at work, as February is peak project delivery season (our year end) so I have to put in all the leg work over the two months prior. I get all my back-burner work taken care of and do continuing education credits as a last resort. Though, I feel like it would almost be impossible for me to run out of work at this point. Me too. I have to get all of my CLE certificates’ completed in January. The manageing partner got a bunch of blank’s from the bar association so all we have to do is fill our name’s in and we get our 24 credit’s immedieately! YAY!! !